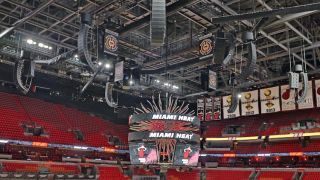 Located in Downtown Miami, FL along Biscayne Bay, American Airlines Arena is home to the NBA’s Miami Heat basketball team. With 2,105 club seats, 80 luxury suites, 76 private boxes, and a total seating capacity of just over 21,000 people, the arena is an upscale facility in every aspect. After updating a sound reinforcement system that had been in service since 2002, the main Arena in-bowl area is now equipped with new loudspeakers from the Aero Series 2 and UX Series catalogs of Valencia, Spain-based D.A.S. Audio. Jorge Arronte, manager of Sound and Matrix, along with David Vickery, the director of broadcast services, were the two on-site personnel responsible for many of the arena’s key facility decisions. Over the years, the two have upgraded numerous areas—both inside and outside—at the arena. This latest loudspeaker upgrade brings the signature sound of D.A.S. Audio to the main arena seating areas. The facility enhancement includes 128 D.A.S. Audio Aero 40A enclosures, 16 Aero 20A cabinets, along with 8 UX-218RA sub bass enclosures, all governed by Lake/Dante loudspeaker management and distribution system.